The Puerto Rican Tanager is endemic to the archipelago of Puerto Rico, usually found in dense vegetation, in pairs or small groups. 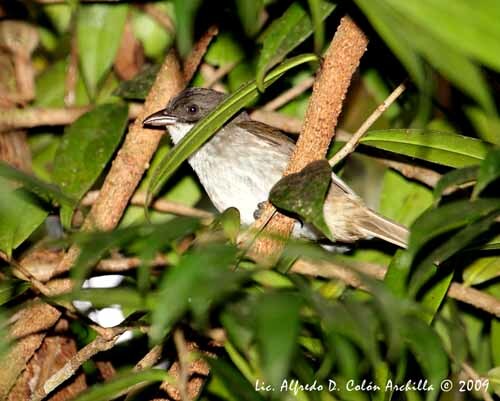 This species was discovered in 1868 by the Cuban naturalist Juan Gundlanch. 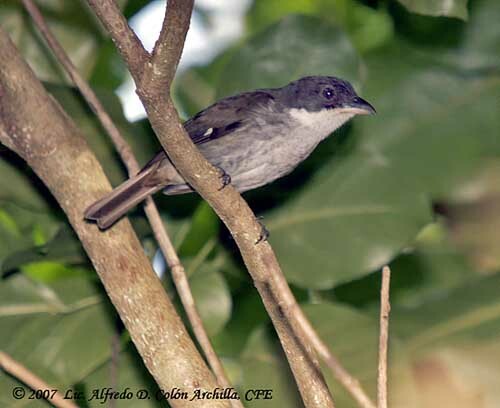 This bird occurs in restricted forested areas, including in mountains. Bur due to heavy deforestation, it is now living in less extended forests, from 200 up to 1330 metres of elevation, at mountains’ top. 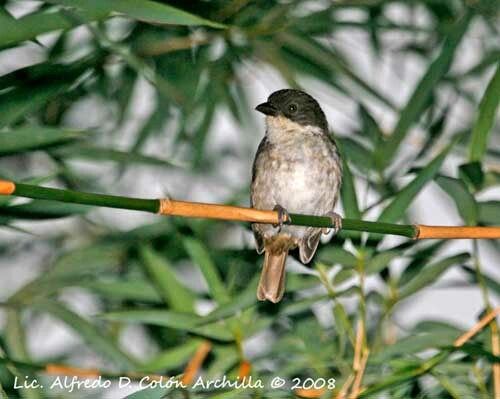 The adult has olive-brown plumage on the upperparts, including wings and tail. We can see a contrasting white spot at base of primaries, and the upperwing wing-coverts are mostly brown whereas the flight feathers are dusky edged brown. The underparts are white. Chin and throat are pure white, whereas breast, belly and vent are white with pale brown mottling. 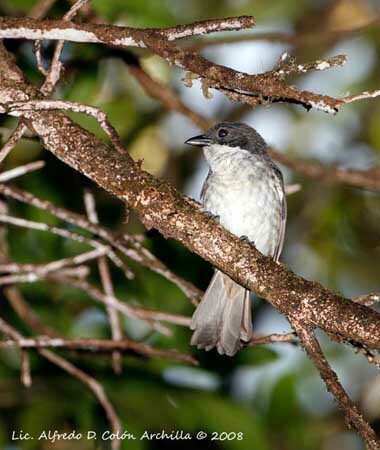 Belly, flanks and undertail-coverts are dull whitish with greyish-brown tinge. The head is blackish to below eye, including ear-coverts, forming a hood. The stout bill is dark greyish-brown with paler lower mandible. The eyes are dark brown. Legs and feet are dark grey. The immature appears browner than adults, especially below, and it lacks the white wing spot. The Puerto Rican Tanager is found in Puerto Rico, on the slopes of the Sierra de Luquillo. The Puerto Rican Tanager frequents undisturbed humid forests, including at high elevation (from 200 up to 1330 metres), second growths, palm forests, thickets and coffee plantations. They roost in flocks in clumps of palms or bamboos. The Puerto Rican Tanager is a noisy bird. It gives harsh, loud “chewp” or “chuck” which may extend into a varying chatter “chi-chi-chit” and also “tsweep, tsweep” similar to a song. We can also hear a short, soft twitter and a thin sigh resembling a heavy exhalation. These vocalizations may be associated with courtship displays. The Puerto Rican Tanager feeds on various invertebrates such as insects (moths, caterpillars, coleopteran, grasshoppers and ants), spiders, snails and frogs. It also consumes fruits and hard seeds. It usually forages in loose groups (up to 12 individuals). They usually are well hidden in the foliage. They may feed in mixed-species flocks. The Puerto Rican Tanager forages from the low understorey to the canopy, by moving and fluttering along small branches and twigs, searching for invertebrates on leaves and on the undersides of large branches. The Puerto Rican Tanager has been observed preforming anting to clean its plumage from parasitic items. During the breeding season, it maintains and defends a territory. It is strongly territorial during this period. They are seen in foraging flocks outside the breeding season. The courtship behaviour of this species is poorly known. But we can suggest that the male displays in order to enhance the white throat, and moves its wings to expose the white wing patch at primaries’ base. Some sounds such as a rapid “tswet, tswet, tswet, tswet” mixed with softer sounds, and an accelerating “schew, schew, schew” may be associated with courtship displays. The Puerto Rican Tanager is resident in Puerto Rico. It rarely travels long-distances, and prefers to move through brush and canopy foliage. However, it is able to fly strongly in undulating fashion. The breeding season takes place between January and August, during which the territory is strongly defended. The Puerto Rican Tanager builds a cup-shaped nest in tangled vines or at the end of a branch, between 2 and 10 metres above the ground. The nest is made with leaves, roots, vines and plant fibres. The inner cup is lined with pieces of palm fronds. The female lays 2-3 creamy-white eggs. No other information about the nesting behaviour. After the breeding season, the Puerto Rican Tanager joins mixed-species flocks (up to 5-6 different species). 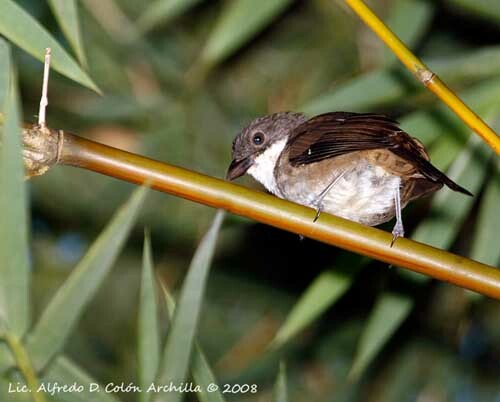 It uses a peculiar contact call, a sharp “sip” to communicate with the other birds. The Puerto Rican Tanager is a restricted-range species, common in most of higher mountain forests in Puerto Rico, and locally common in less suitable habitats. Declines occurred due to heavy deforestation in the 19th century. However, the species has recently expanded into other suitable habitats, due to the re-establishment of the native forest and the creation of protected areas. This species is not currently threatened and populations appear stable.